Can anyone really write a book in five days? That was my first thought when I saw the advertisement for Tom Bird’s Writing Retreats. Like most would-be novelists I’ve been working on a novel for several years; in fact, I have several folders of would-be books. I’m a NaNo flunky. I even have a short story I’ve been picking at for a year. In an attempt to get past my unconscious blocks I downloaded a self-hypnosis CD a couple of years ago--I’ve listened to it twice. Considering my history I decided I should just concentrate on building my freelance business and put my book on the backburner…still. I forgot all about the retreat until someone suggested I take the course and write about it. So, here I am, all signed up and wondering what I’ve gotten myself into. My biggest fear at this point? That I will be at this retreat with all eyes on me and nothing will come out! What was I thinking? Welcome to my journey! I will be attending Tom Bird’s Write a Book in 5 Days Retreat in beautiful Sedona, Arizona March 24th through 29th and I’m inviting you to come along—literally! Tom has a number of seats available at a special price for WOW! readers. It is an unadvertised special so you need to contact Tom personally for details. 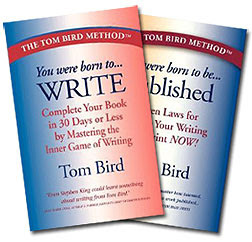 (You can contact Tom at TomBird@TomBird.com or call him at 928-203-0265) If you are ready to finally write that book, come along with me! For the rest of you—I’ll be posting entries on my experience as I go along. Surprise #1 (I guess I’m expecting more?) This is not just a 5 day retreat. I just received my Attendee Information Package; Holy Moly, there is a lot of information here! There are two books to read prior to the retreat. One titled You Were Born to Write and the other is You Were Born to Be Published, both written by Tom Bird. Tom believes that each one of us has a book to write; his role is to assist us in overcoming our inner blocks and bringing forth our inner author. Reading these books prior to the retreat helps prepare us for the journey. The books are accompanied by a subliminal CD called "Transitioning Back to the Writer You Were Meant to Be." In addition to this work-at-home material there are 4 webinars to attend; apparently there are writing assignments given during these sessions. Whew! I wasn’t prepared for the preparatory work :) My initial sense of overwhelm, however, is melting into a nervous excitement. Can Tom really midwife my inner author into being? Am I ready to fully step into this role I’ve been toying with? We’ll see. Note: Tom mentioned he had two spaces available at $795 each on a first-come basis. If you are ready to birth your inner author contact Tom and ask if these two spaces have been filled—it’s a terrific price! Thank you so much for posting this! Here I was looking all over for current info on this specific retreat and Google found your post for me. I will be following the adventure and would like to hear every detail!